I have a mega sweet tooth and am always looking for healthy ways to satisfy it. The best part about this sweet treat?? There's only 2 ingredients! Once the bananas are frozen, place them in a food processor (or blender). 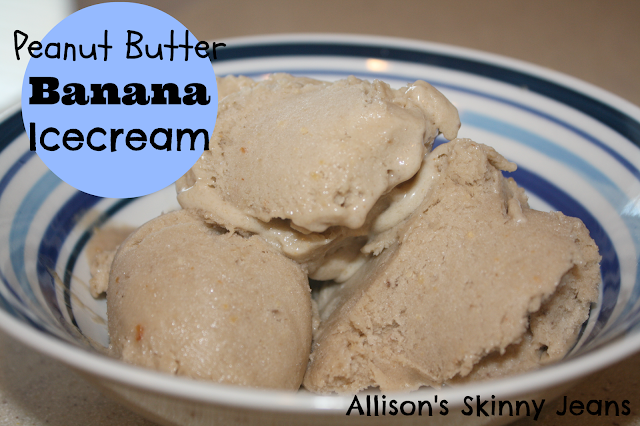 Keep processing and scraping down the sides until the bananas are smooth ice cream consistency. Be patient - it takes a little while. Then add in 2 tbsp of peanut butter and mix until well blended. You can eat it immediately if you like a soft serve texture. We placed ours in a freezer safe container and froze it for several hours so ours would be more like ice cream. Try adding cocoa powder for a chocolatey taste, or substituting peanut butter for almond butter! Mix-ins are also a fun idea! Can you guess who will be asking for a Yonana Maker for Christmas? 1/4 of the recipe is about 150 calories! And essentially, all you've eaten is a banana with some peanut butter - but in a much more exciting form! Make sure you also check out 2 Ingredient Oatmeal Banana Cookies! This sounds really yummy. I am pinning to give it a try. Happy to be a new follower. Always happy to have a new follower! My husband and I really enjoyed this one. I've thought about giving this one a try. I'm not a huge banana person, but I do love some peanut butter and some ice cream! You may not like it if you don't like bananas, but it's worth a try! Let me know! What a great combination of flavors and it is low in calories! What could be better? Thanks for sharing at the In and Out of the Kitchen link party. I am so glad you dropped by! It really does hit the spot when you need a sweet treat! I suffer from the same sweet tooth problem! Every night after dinner I'm constantly battling it. I love this low-calorie sweet tooth fixer! Pinning! I do the same thing after dinner - I feel I deserve a treat, haha! At least this way I'm just eating bananas and peanut butter, but feel like I'm getting something better! Simple and delicious! I love peanut butter and banana on toast so this really appeals to me. I have some bananas in the freezer already so I'll be able to try it. Thanks for sharing. I am going to try this...have some bananas frozen in the freezer right now. It sounds really good! Thank you for sharing it at What We Accomplished Wednesdays. Have a great weekend! Let me know how it turns out! We really enjoyed it. It was husband approved. This is so great--we put Nutella in ours.